We have a funny thread about Craigslist Insanity. Let's have one about good stuff you bought and sweet deals you found either Craigslist or local, garage sales, ebay, etc. I didn't look in the box, but it was full of stuff, figured it has to have something I could use. She promised the tank was just fine. It was clean, and she claims to have used it within a few years. Got the 29 home and filled it up on the deck to test. Six inches of water and it leaked like a sieve. Every single corner leaked. Fast leaks. Bummer. That found a new home today with a friend that keeps reptiles. Will work great for that. The stand is great. Rock solid, just dirty and in need of TLC. I'm going to prime and paint it gloss back. Fits tanks top and bottom, worth the $15 alone. Open the big box and this is where I got happy. New in box UG filter, meh, not for me, but I can sell it. Three powerheads, two DOA, one 550 model works great, that can be used somewhere. Supra 3 air pump, dual outlet. Old school white pyramid shape. Hooked up some lines, plugged in and WOW, it's as strong as brand new and quiet. Win! Marineland Penguin 110 h.o.b. filter with numerous brand new cartridges. Filled with water, hung on wash basin, works perfect and doesn't rattle. Another win. Small tank filter or bio only for supplemental on bigger tank. Get to bottom of the box, what's this? 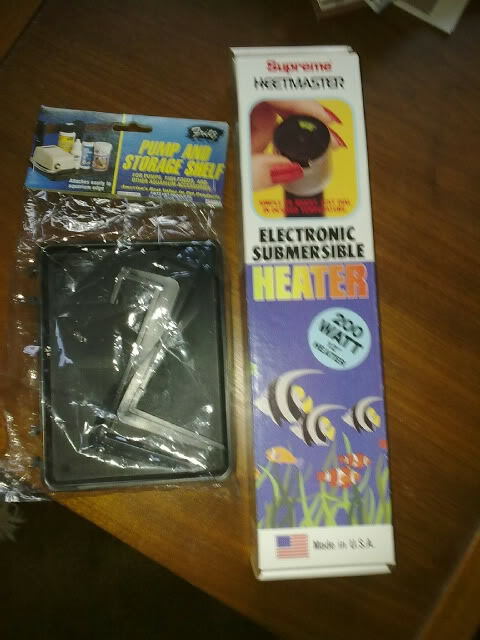 Brand new in box with manuals, submersible heaters and tank shelves! Plural! I've been looking for tank shelves forever and can't find any at good prices. Here I have a bunch of them, new! Woohoo! Now I'm jazzed. Under those, Supreme Heetmaster submersible heaters, 200 watts. All new in the boxes, manuals, everything. Untouched. Yeah, I know, some say no way, but I'll test them each for a week in the wash basin. They'll be perfect for tanks with smaller fish that can't break them. Between what I'll sell a few shelves for and some heaters, I'll end up making some money and getting stuff I can use. Makes up for being bummed over the leaky tank for sure. Not too long ago I bought a 100 gallon tank with stand and fluval 405 along with a bunch of extras for $80 dollars. And that same day another person was giving away 10 African cichlids because they were moving away. my 44 gallon corner came with the stand, hood, lights, uv sterilizer, a fluval canister, 2 powerheads, sand and live rock all for $80. that broke me until the next payday, but I had to jump on it. the uv sterilzer was huge, but I dont know if it works or not, dont know how to set it up lol, the lights were dead and the canister was dead (kinda). my 75 came with the stand and a box of misc decorations and a bunch of lava rock for $150. found a protein skimmer for $50 but had to sell it because it wont fit under the tank. I got my 30 gallon tank and stand off of my local classifieds for 30 bucks. oh man i'd be kicking myself missing that 125 deal!! Just picked up a 1050 koralia, a 1400 koralia and a mag 9.5. All brand new in the box, for $100. Guy just closed down pet store.